It has been estimated that over 80% of terrestrial plants form a symbiotic association with fungi. Species of fungi that reside within living plant tissue without causing symptoms of disease in their host are known as fungal endophytes. Fungal endophytes colonize a variety of both monocot and eudicot plants which suggests that this symbiosis predated the monocot-dicot split 140-150 million years ago. It is also hypothesized that phototroph-fungi associations enabled plants to first colonize land. This mutualistic association could have helped plants acclimate to new environmental stresses such as desiccation, increased exposure to solar radiation, and more extreme temperatures differences. Fungal endophytes remain an important component of today’s terrestrial ecosystems, and many enable their hosts to thrive in harsh environments. Studies show that fungal endophytes can enhance the drought, salt, and soil temperature tolerance of their host plant in addition to increasing resistance to parasitic fungi and herbivores. With growing concerns about climate change and its effects on agriculture, learning about fungal endophyte conferred drought tolerance has become increasingly important. By influencing plant morphology, development, and physiological and biochemical responses to stress, fungal endophytes can induce mechanisms of drought avoidance, drought tolerance, and drought recovery in their hosts. Figure 1. Four stages of root colonization by Class 2 endophyte Piriformospora indica . 1. Extracellular colonization of the root surface. 2. The hyphae penetrate the epidermal (RC) and cortical (C) cells. Cell organelles (e.g. nucleus; blue) remain intact and plasma membrane invaginate (dark gray lines inside cells). 3. The plasma membrane still surrounds intracellular hyphae while biotrophically colonized cells die (light gray filling of cells) and organelles are disrupted. 4. Fungal reproduction in RC and C cells. Endodermis cells (E) are not colonized. Nonclavicipitaceous endophytes are highly diverse and have been isolated from every major lineage of land plant, which includes nonvascular plants, ferns, conifers, and angiosperms. Class 2 endophytes are usually found in the roots, stem, or leaves of their hosts. Like Class 1 endophytes, they can also be transmitted either vertically through the seed coat or horizontally. They are unique in that they can confer habitat-specific stress tolerance to their hosts, and, as a result, they infect a higher percentage of plants in high-stress environments. They often increase root and/or shoot biomass in their host. Class 3 fungal endophytes colonize the shoot of plants while Class 4 endophytes colonize plant roots. Both are horizontally transmitted. Unlike the other classes, Class 3 endophyte colonizations are highly localized, and a diverse number of species can colonize an individual plant. Few studies have been performed on Class 3 and 4 endophytes and little is known about their ecological role or their ability to confer tolerance. Additionally, Redman et al (2015) examined the osmotic concentrations in plants grown with and without heat-stress tolerant fungal endophytes. The differences in pattern between the two groups lead them to conclude that symbiotic plants do not rely solely on increasing osmolyte concentrations. Redman et al (2015) isolated three Class 2 fungal endophytes from rice relatives to test how well they would confer abiotic stress tolerance to rice plants. Fusarium culmorum (SaltSym) was isolated from the coastal plant Leymus mollis which is exposed to high salt stress, while Curvularia protuberant (TempSym1 and 2) was isolated from Dichanthelium lanuginosum which grows in geothermal soils that can reach temperatures of up to 60 degrees Celcius. Rice plants with and without the fungal endophytes were grown in greenhouse conditions and subjected to treatments of salt, cold, and drought stress. Fungal endophytes have many potential applications in agriculture and conservation, yet there is still much that is not known about plant-fungi symbiosis and the mechanisms behind it. A more complete understanding of fungi’s role in plant community dynamics and ecosystem stability will inform conservation efforts around the world. While many fungal endophytes show habitat-adapted symbiosis, the fact that there is still lower biodiversity in high stress environments indicates that plants require more than just a fungal endophyte in order to be successful. Nevertheless, fungal endophytes’ ability to confer resistance to pathogens and deter insect herbivory gives them promise as alternative solutions to chemical pesticides and fungicides. Moreover, introducing fungal endophytes to crop may increase their drought tolerance by reducing their water consumption and increasing nutrient uptake. This may be used to increase crop yield in arid climates and mitigate the negative effects of climate change. This review examines how fungal endophytes re-program plant stress responses. 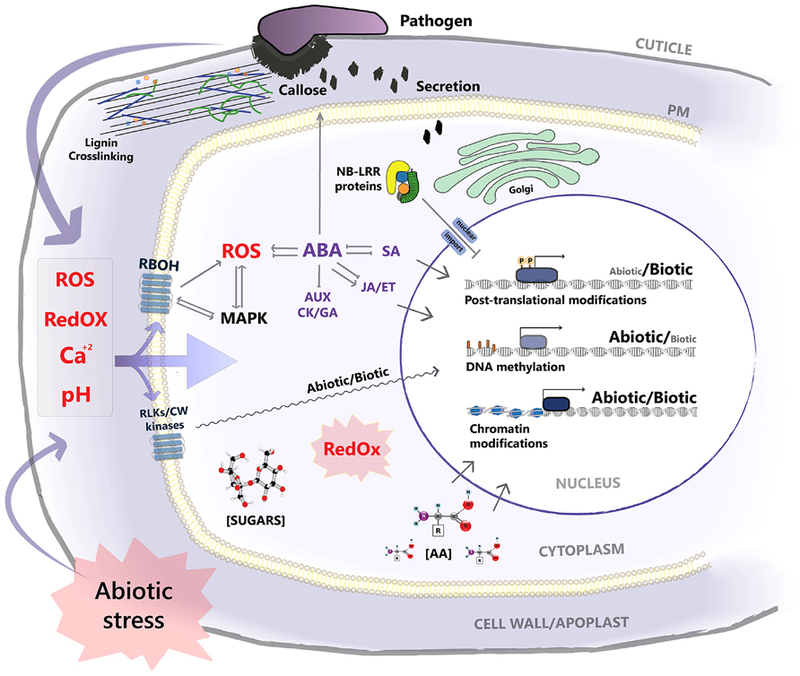 As fungal endophytes are a "frequently overlooked component of crop ecology," the authors discuss mechanisms in plant-endophyte stress interactions, important endophyte-produced bioactive secondary metabolites such as the plant hormones Abscisic acid, Salicylic acid, Jasmonic acid, and gibberellins and suggest areas for future research in agricultural ecosystems. | Smith, S., Read, D., 1997: Mycorrhizal symbiosis, 2nd edn., Academy Press, San Diego. | Schardl, C. L., Leuchtmann, A. & Spiering, M. J. (2004) Annu. Rev. Plant Biol. 55, 315-340. | Malinowski DP, Belesky DP. (2000). Adaptations of endophtye-infected cool-season grasses to environmental stresses: mechanisms of drought and mineral stress tolerance. Crop Science 40: 923–940. | Cheplick GP. (2006). Costs of fungal endophyte infection in Lolium perenne genotypes from eurasia and north africa under extreme resource limitation. Environmental and Experimental Botany 60: 202–210. | Gechev, T. S., Van Breusegem, F., Stone, J. M., Denev, I. and Laloi, C. (2006), Reactive oxygen species as signals that modulate plant stress responses and programmed cell death. Bioessays, 28: 1091–1101. | ARACHEVALETA, M., BACON, C., HOVELAND, C., & RADCLIFFE, D. (1989). Effect of the tall fescue endophyte on plant-response to environmental-stress. Agronomy Journal, 81(1), 83-90. Edited by Sarah Barnes, a student of Nora Sullivan in BIOL168L (Microbiology) in The Keck Science Department of the Claremont Colleges Spring 2014. This page was last edited on 15 April 2015, at 05:18.